I am not a neat freak. For as much as my husband would like for me to be, I am most definitely not. Even so, there is nothing more frustrating than cooking and seeing the pile of dishes getting bigger and bigger. It's like a monster that just keeps growing. Here are a few tips I use while cooking in order to keep things under control. Keeping a Clean Kitchen While Cooking. 1. Start Clean. It's hard to start cooking when there is already a sink full of dirty dishes. When the sink is full it make is so you can't wash a rinse any bowls or utensil (see below) while you are going. It also just creates a difficult atmosphere to cook in. Try to make sure you start with a clean workspace, it's going to make it easier to end up with one. 2. Get out everything you need at the beginning. Take a minute to plan out what you are doing and the order you would like to do it. Get out all your ingredients, utensils, bowls and pots and pans. This way you have a plan and are not just "winging" it. 3. Garbage Bowl. I think the 1st time I saw this idea was on Rachael Ray. She always has here garbage bowl on her shows. This is a perfect way to keep your trash off the kitchen counter or just to keep you from running to the garbage can. 4. Clean up as you go. The mess can pile up fast if you move onto cooking or baking a second item before you get your first one put away. Lots of ingredients, bowls and utensils on the counter also make it hard to find what you need and you may end up using 4 spoons and extra mixing bowls. 5. Wash off your bowls and cooking utensils as you go. If you are cooking 2-3 things no need to grab a new bowl. Do a quick rinse with hot water and soap and you should be good to go for your next recipe in a flash. 6. Make more 1 dish meals. One dish meals on the stove top like jambalaya and soup are a great way to keep the pans under control. Ans some of you may not like this idea but I will often mix casseroles in the same dish I bake them in, why dirty up a big bowl just to pour into the baking dish? You have to use your judgement, but personally I have found very little sticking issues. 7. Grate cheese onto a paper towel. Not the biggest "green" tip. But I don't mind occasionally using paper products when it will save me on a bit of clean up. 8. Double your recipe and freeze for another night. 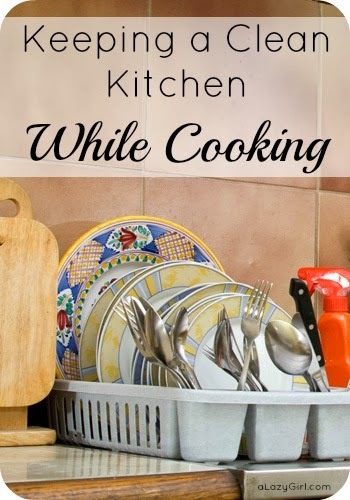 This one is kind of a bonus tip because it won't keep your kitchen cleaner the 1st time around, but it will the next time when you don't have to cook! How do you keep the kitchen clean while you are cooking? What are your best tips?